King County monitors the ecological health of Forbes Creek in a variety of ways, including collecting and analyzing water, sediment, and benthic invertebrate samples. Water quality samples are collected monthly near the mouth of the creek near the end of the pump access road on NE 106th Street. In the spring of 2016, the historical site, station 0456, went dry. Station 0456A was established a little further south where the flows pass through a culvert. Sampling began in 1979 and continued until 2008 when budget cutbacks forced King County to reduce the breadth of its water quality monitoring program. However, routine water quality sampling at this site resumed in February 2013. Sediment samples have been collected from Forbes Creek as part of the Streams Sediment Monitoring Program starting in 1987. 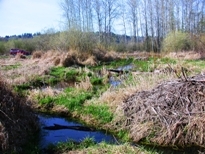 King County began collecting benthic macroinvertebrate samples in Forbes Creek in 2002. From time to time, additional studies have been conducted on Forbes Creek . Click here for more information about Special Studies. More than three-quarters of total land use in the Forbes Creek basin is developed. The remaining land use is mostly (deciduous) forest, while agriculture is not present. Very little scrub, wetlands, and other land use (barren land) exist. The development is largely low intensity, open space, and medium intensity. Less than a quarter is a high intensity development. See Table 1 below for more details on land use. Little is known about the existing fish population in Forbes Creek. The creek historically supported cutthroat trout and coho salmon have been introduced (Metro, 1990). From 1996 to 2015, volunteers with the Salmon Watcher Program made observations at river mile (RM) 0.2 and RM 0.9. Only one coho was observed in the creek in 2001 (King County, 2002). State water quality standards were revised in 2003. Forbes Creek is now categorized as “Core Summer Salmonid Habitat” for aquatic life use, and “Extraordinary Contact” for recreational use. Forbes Creek is on the Washington State Department of Ecology’s (Ecology) 303(d) list for violation of DO, temperature, FC bacteria, and bioassessment standards (Category 5). A 25-year (1979 – 2007) trend analysis was conduced with baseflow data collected from Forbes Creek. This analysis showed some improvements in the water quality since 1979. Ortho-phosphorus, total nitrogen, nitrates, total suspended solids, and FC bacteria have all shown a significant decrease over this 29-year time period. However, stream temperatures and conductivity have increased, and DO concentrations have decreased significantly during this same time period. A Water Quality Index (WQI) rating system was developed by the State Department of Ecology that evaluates several water quality parameters and gives a single rating of “high,” “moderate,” or “low” water quality concern. To see how Forbes Creek ratings compare with other stream sites, please visit the Water Quality Index webpage. King County does not currently operate any gages on Forbes Creek. Sediment samples were collected from three stations approximately a mile apart, along a three mile reach of Forbes Creek in the summer of 2005 (see map). Concentrations of bis(2-ethylhexyl)phthalate (a chemical found in some plastics) and nickel at site 0456 were above Sediment Cleanup Objective (SCO) concentrations. Additional data were collected (acid volatile sulfide/simultaneously extracted metals ratio) at these sites to better understand the toxicity potential of metals. This information indicates metals are not likely bioavailable at 0456. For more information about benthic macroinvertebrates and King County’s Benthic Macroinvertebrate Program, please visit the King County Stream Bug Monitoring webpage. To see the benthic macroinvertebrate data for Forbes Creek, please visit the Puget Sound Stream Benthos webpage. In WRIA 8, citizens, scientists, businesses, environmentalists, and governments are cooperating on protection and restoration projects and have developed a science-based plan to conserve salmon for future generations.